Hi friends! 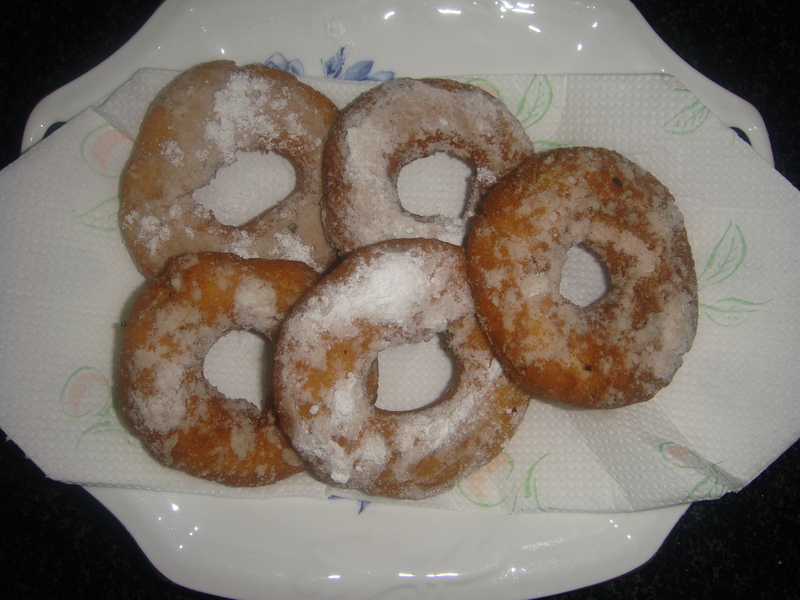 If you are a Doughnut lover, now you can make these yummlicious Doughnuts at home! Doughnuts are usually deep-fried from a flour dough, and typically either ring-shaped or without a hole. Various toppings and flavorings are used for different types, such as sugar, chocolate, or maple glazing. Cream sugar and oil. Sieve All purpose flour/maida, baking powder and salt and add these to the creamed sugar and oil mixture. Knead these ingredients into a soft dough by adding milk. Cover the dough with a wet cloth and leave for proving for about 15 minutes. When proved, divide the dough into 10 equal parts. Round off each part. Keep each portion on a rolling board and cut the centre with a cutter. Deep-fry the doughnut on a medium flame until golden. Drain on paper kitchen towel. Roll the hot doughnut into a powdered sugar and cinnamon mix. Serve hot. Powdered doughnuts are cakes coated in powdered sugar. In one such doughnut, you can expect 340 calories, with 200 of them coming from fat. There are 22 g of fat, with 10 g being saturated fat. They also have 25 mg of cholesterol, 300 mg of sodium and 38 g of carbohydrates. Powdered doughnuts also contain 13 g of sugar and 4 g of protein, along with 4 percent of suggested daily values of vitamin A, 2 percent of calcium and 6 percent of iron. You made the things so easy!! !